We have every Denver Loft for Sale listed below by loft building and neighborhood. If you are looking for an MLS listing in a specific building, then use the search below. If your search is broader, you can also search by neighborhoods where lofts are prevalent. If you are new to Denver, here is the Denver Neighborhood map. Tip: Use CTRL+F (pc) or COMMAND+F (mac) to search for a specific loft building. Loft inventory is pretty low at the moment, and most buildings don't have an active MLS listing. 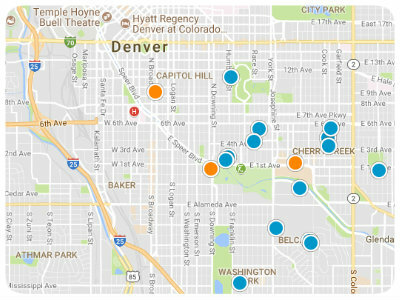 Search by Denver Neighborhood instead, or use our powerful map search and draw a polygon over just the area where you want to live. You can save your search and get email alerts when new listings hit the market. Might as well just call Denver “Loft City.” When Coors Field was built in LoDo in 1992, what followed was a surge of loft construction. No building or piece of land was safe – you couldn’t build them fast enough. Some were old warehouses converted into true lofts. After all, Wikipedia defines a loft as “a large adaptable open space, often converted for residential use (a converted loft) from some other use, often light industrial.” A perfect example would be the Watertower Lofts at 2960 Inca St. Lofts popped up everywhere and LoDo was reborn. Denver Lofts for sale range in size and price depending on location, style of building, and amenities. If you are looking for Denver Lofts then you are in the right place. We dedicated a page to every loft building in Denver – so you can view MLS listings just for that address and view only lofts for sale in that building. In some cases, there may be no active MLS listings for that address, so no lofts will be displayed. Check back again soon or create an email alert to capture new listings for just that loft address. On our Denver Lofts for sale page we have lofts broken down by the neighborhood where they reside for easy viewing. Also take a look at our “Top 21” Denver Loft buildings below. We have literally seen dozens of lofts for sale in every Denver loft building – so we know the loft landscape inside out. Picking our favorites wasn’t easy. All of our loft listing pages also includes the year the loft building was built, which year it was converted if it is an older building, and how many units are in the development.